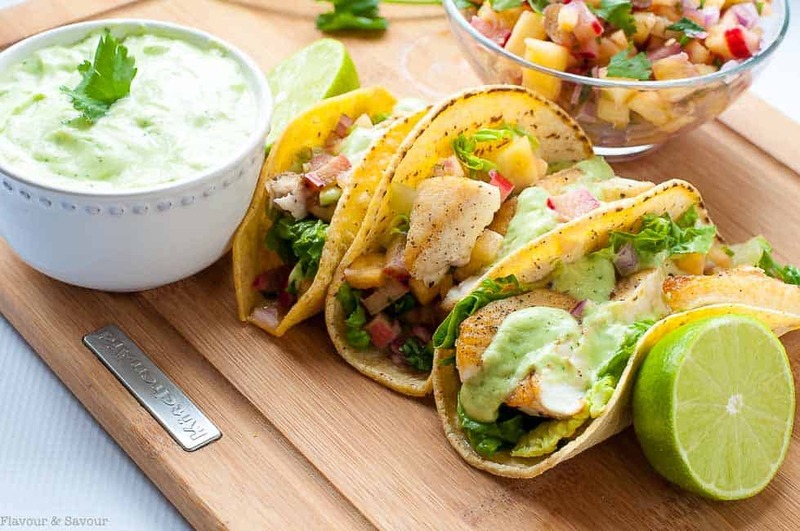 These Grilled Fish Tacos with Pineapple Rhubarb Salsa are stuffed with salt and pepper crusted fish, a piquant fruit salsa and they’re topped with a creamy avocado dip. What is it about taco nights that seems to improve everyone’s mood? I love looking forward to a casual meal like fish tacos. 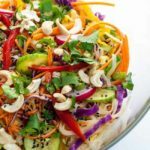 They’re fun to put together, they’re a little messy, and they make a weekday meal seem like a festive occasion. I made these Grilled Fish Tacos with Pineapple Rhubarb Salsa recently, primarily as a kitchen experiment. They’re now officially “a thing” and I’m saving this recipe to use over and over. Pineapple Rhubarb Crisp has been a favourite dessert ever since I discovered that the natural sweetness of pineapple greatly reduced the need to add sugar to the recipe. Today, I decided to make that combo into something different. I came up with this sweet and spicy Pineapple Rhubarb Salsa to add to our grilled fish tacos. 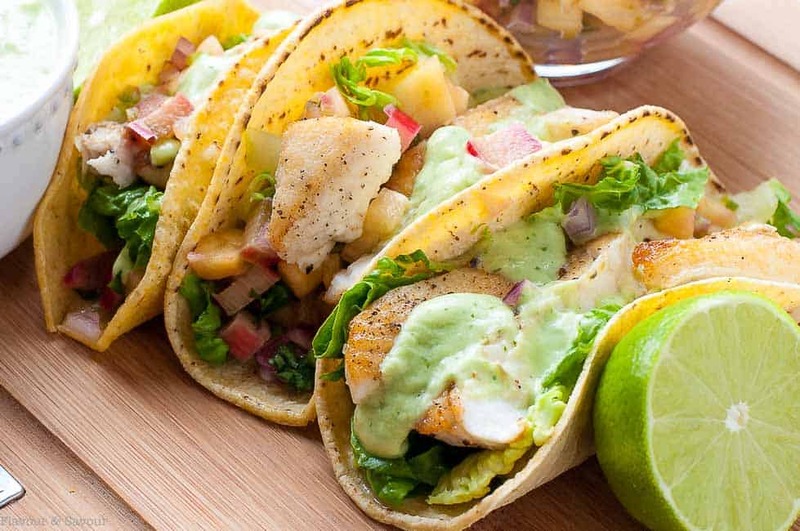 Crisp salt-and-pepper-crusted halibut was a great choice for these fish tacos, but any firm white fish would be equally as delicious. Since halibut is so expensive, I used some of the thinner small pieces that were left when we filleted and froze several pounds of fresh halibut earlier this year. They were perfect for these tacos. 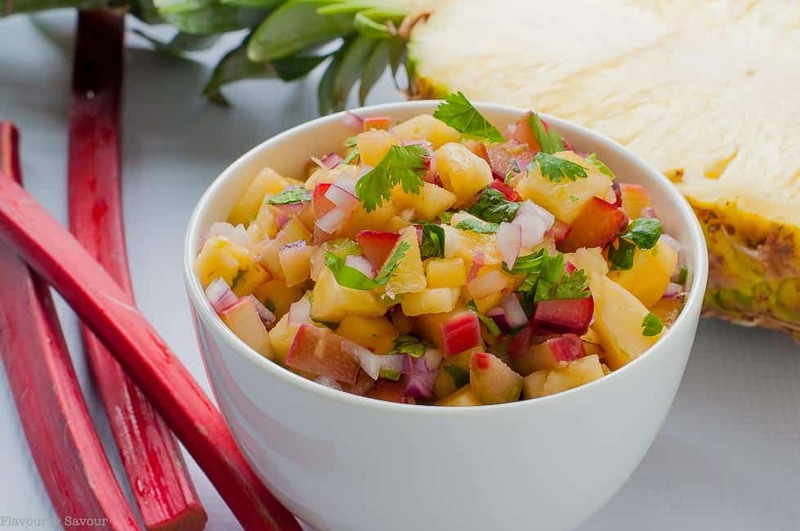 This Pineapple Rhubarb Salsa is a little sweet and a little spicy. Rhubarb adds some crunch and red onion and jalapeño pepper contribute the heat that we expect from a salsa. 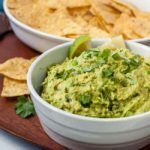 The Avocado Cream is an easy but oh-so-delicious dip that holds everything together. Simply combine Greek yogurt with avocado and flavour with a some cilantro, honey and a squeeze of lime. While rhubarb is actually a vegetable, it’s often considered a fruit because it is most commonly used as one. It’s a powerhouse of nutrients. I started eating more rhubarb, and growing my own, once I discovered it was a good source of calcium, Besides that, it is packed with other minerals, vitamins, and fiber. 100 grams of rhubarb has only 21 calories. and a dollop of avocado cream. With the help of napkins, we devoured these and looked around for more! The leftover salsa and a bag of tortilla chips didn’t last long either. When rhubarb season rolls around, I love to experiment and find new ways to use it. I’ve made both this Strawberry Rhubarb Smoothie and this Skinny Strawberry Rhubarb Parfait several times already this Spring. The mint in my garden is thriving, so Rhubarb Mint Mojito will be on the menu soon, once those warm sunny evenings finally arrive. But in the meantime, I’ll be making these fish tacos with pineapple rhubarb salsa regularly. 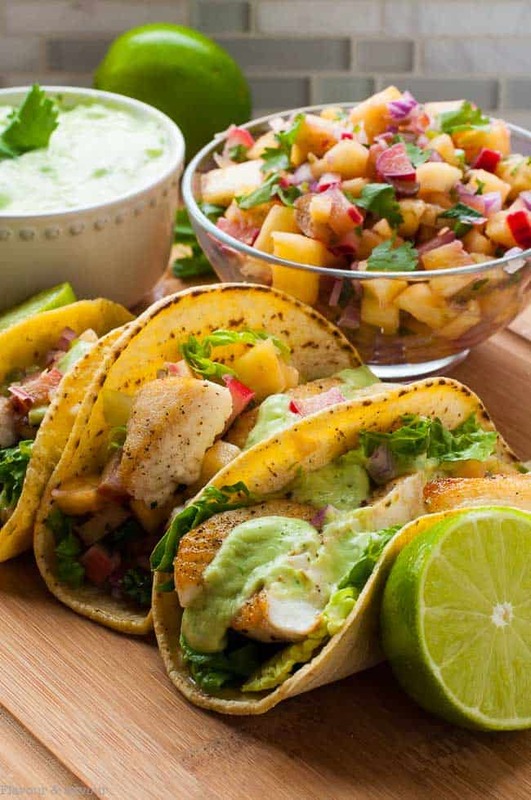 These Grilled Fish Tacos with Pineapple Rhubarb Salsa are stuffed with salt and pepper crusted fish, a piquant fruit salsa and they're topped with a creamy avocado dip. 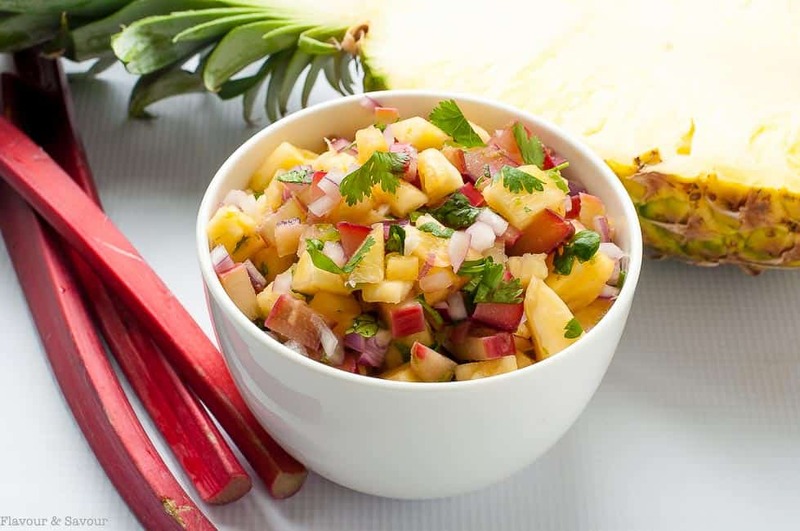 Prepare the Pineapple Rhubarb Salsa first to allow flavours to blend. Combine all ingredients in a medium bowl, cover and refrigerate. Combine the Avocado Cream ingredients in a blender and set aside. Heat a grill or skillet. Add a high heat oil, like grape seed oil, and heat until almost smoking. Pat the fish dry. Sprinkle with salt and pepper. Add to hot grill or skillet and sear for 2 - 3 minutes or until golden brown. Using a fish turner, flip and cook for 2 - 3 minutes on the other side, just until fish flakes easily with a fork. Cook time will depend on the thickness of your fillet. Do not overcook. The fish will continue to cook after you remove it from the skillet. Sprinkle lightly with dried chili flakes, if desired. Heat tortillas on grill, brushing with a little oil to prevent sticking. Assemble the tacos. Add greens, salsa, fish, and top with avocado cream. Serve immediately with napkins! Thanks Nicoletta! I was surprised at just how good the pineapple rhubarb salsa was! It was an experiment that succeeded! I love rhubard and also use it for sweet dishes. I will definitely want to try this salsa! This is a salsa I’ll make over and over! The rhubarb gives it a nice crunch. Rhubarb has such a short season, so I try to use it in as many ways as I can while it’s fresh. Fish tacos are so versatile, aren’t they? Now this is combination that I would never think of. It looks absolutely delicious and I bet it tastes just as good. Rhubarb is one of the many things I miss…boohoo. Beautiful looking dish! This is a fun way to make tacos! I would never have thought of mixing rhubarb and pineapple, I need to try this out for sure! Lovely picture also! Thanks Marie! I hope you get a chance to try it! 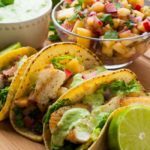 I enjoyed fish tacos on our recent trip and am inspired to make yours now! I also really like the idea of combining pineapple with rhubarb! I have resisted using a lot of rhubarb because of all the sugar that usually goes with it. Now I can reap the nutritional benefits without the guilt! I feel the same way, Cathy. The natural sweetness of pineapple really balances tart rhubarb. Hope you like it as much as we do! 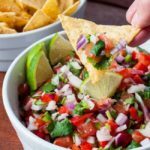 I love the idea of rhubarb in salsa! I have a bag in the freezer and am choosing carefully as to what to do with it. I need to try this! We love fish tacos ’round here! 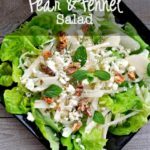 Yes, Terri–try it! It’s so good! I have also known to be a little stingy with my rhubarb. I make a rhubarb compote and add it to parfaits and smoothies. If you’re looking for rhubarb recipes, I you can find a few more in my Recipe Index. Thanks for stopping by!